In 1981, Artur Winter, the deputy director of “Exquisit,” a nationally-owned enterprise that produced and imported the high-quality textiles sold in stores of the same name, was appointed head of the department of fashion at the School of Art and Design at Berlin-Weißensee. After Winter’s appointment, the school placed new emphasis on meeting industry requirements. Each summer, the school hosted an open house, which included a fashion show with designs by fashion department students. A lack of resources meant that students had to make a virtue out of necessity, and most of them ended up modeling their own designs. 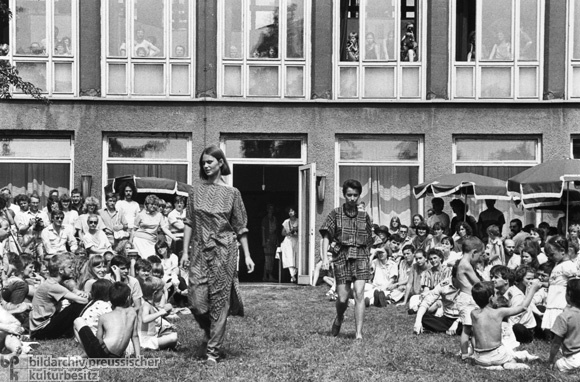 Below is a fashion show held at the school in July 1985. Photo by Volker Döring.